January 25, 2019 – The Connecticut Audubon Society will develop a three-acre native bird sanctuary within their Deer Pond Farm in Sherman, thanks to a $10,000 matching grant from the Hollis Declan Leverett Memorial Fund, Bank of America, N.A., Co-Trustee. Connecticut Audubon Society will introduce early successional wildflower meadows with pockets of shrubs and small trees to increase diversity and abundance of native and desirable bird species at the site. The new habitat will replace the dead and dying white ash grove, which is succumbing to an invasive insect, the emerald ash borer. Foundation funds will also cover the development and installation of permanent interpretive signs. These will highlight ecological attributes of the area, and will educate visitors about how they also may be able to improve habitat for birds and other wildlife. Work on this grant will begin in the spring and be completed by winter. The location of the new garden is at a spot where several trails converge, making it easily accessible to the preserve’s visitors. Over time, it is expected that the new Garden/Birding Hot Spot will become a top destination for hikers and birdwatchers throughout Connecticut. The project builds on pollinator garden and invasive species management efforts already underway in other sections of Deer Pond Farm. Connecticut Audubon Society’s mission is to conserve Connecticut’s environment through science-based education and advocacy focused on the state’s bird populations and their habitats. Deer Pond Farm is our newest and largest sanctuary at 835 acres. Hollis Declan Leverett Memorial Fund is named in honor of Hollis Declan Leverett, an avid birder, who died prematurely as a young adult. The foundation was created by his parents, Hollis M. and Helen E. Leverett, in his memory. This Motus map show where the Rusty Blackbird that passed Deer Pond Farm (the dot near the bottom) has been detected. Click the map to visit the Motus website. December 4, 2018 – Is it big news that a bird flew past our Deer Pond Farm preserve in Sherman? The receiver at Deer Pond Farm and another that will be erected at Shepaug Dam in Southbury early next year mean that Connecticut Audubon is now participating in a growing network of tracking sites that might well revolutionize bird research. 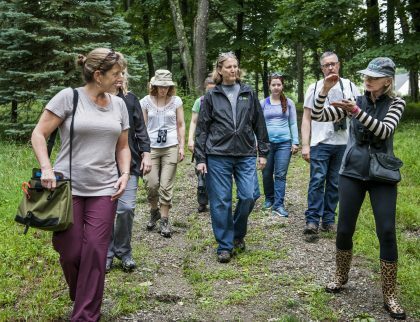 Director Cathy Hagadorn, far left, leads a walk at Deer Pond Farm. Photo by Melanie Stengel. The Connecticut Audubon Society received a generous bequest in 2017, from the estate of Kathryn D. Wriston, of 835 acres of rugged hardwood forest, meadows, and wetlands straddling the state border of Sherman, Connecticut, and Pawling, New York. Called Deer Pond Farm, the property includes a network of 20 miles of trails. The grounds and trails of the Connecticut section opened in July 2017. The New York section opened in April 2019. The sanctuary is now open year-round, seven days a week, from dawn to dusk. Parking and access to all trails is at 57 Wakeman Hill Road, Sherman. The property includes a house on Wakeman Hill Road, which serves as Deer Pond Farm’s office. Cathy Hagadorn is Deer Pond Farm’s director. The Wriston bequest gives the Connecticut Audubon Society a major location in the western part of the state, to go along with its centers in Fairfield, Milford, Glastonbury, Pomfret, and Old Lyme. The bequest also includes an endowment to manage the property and conserve it as wildlife habitat. Deer Pond Farm sits in the highlands along the Connecticut-New York border. About 620 of its 835 acres are upland forest; 125 acres are forested wetlands, and 59 acres are meadow. About 100 species of birds have been reported on or near the property during breeding season, including forest birds such as Broad-winged Hawk and Scarlet Tanager, marsh birds such as Virginia Rail, and birds such as American Woodcock, Eastern Towhee, and Chestnut-sided Warbler, which nest in young forests or shrubby areas. Mammals include bobcat, several bat species, fisher and long-tailed weasel, beaver and black bear. As many as 11 species of snake possibly live on the property. Numerous reptiles and amphibians breed in its 11 vernal pools. The Deer Pond Farm list includes spotted salamanders, slimy salamanders, dusky salamanders, and wood frogs. Deer Pond Farm Bird Checklist – click here. Deer Pond Farm Trail Map – click here. Deer Pond Farm Trail Descriptions – click here. Deer Pond Farm Sanctuary Rules – click here. Deer Pond Farm is excited to have completed phase one and two of our Bird & Pollinator Display and Education Garden. This garden serves to improve habitat and create a warm welcome area where visitors can enjoy a beautiful landscape planting and learn the benefits of utilizing native plants. It occupies an area where Mrs. Wriston kept a nursery to protect young seedling plants such as our native Eastern White Pine. Phase one focused on defining the boundaries and planting areas of the garden, and the selection and installation of native trees and shrubs. This includes plants such as Flowering Dogwood (Cornus florida) which is a host plant for the butterfly Spring Azure, is visited by several native bees for nectar and pollen, and provides fruit for birds. Spring Azure will also enjoy Maple-leaf Viburnum (Viburnum acerifolium), Meadowsweet (Spirea alba var. latifolia), and Highbush Blueberry (Vaccinum corymbosum). Other butterflies and moths that will have host plants and nectar include: Brown Elfin, Cecropia Moth, Henry’s Elfin, Huckleberry Sphinx Moth, Hummingbird Clearwing, Promethea Moth, Saddleback Caterpillar Moth, Spicebush Swallowtail, and the Striped Hairstreak. American Robin, Cedar Waxwings, Northern Cardinal, Yellow-rumped Warbler and other fruit-eating birds will have their choice of Flowering Dogwood, Highbush Blueberry, Maple-leaf Viburnum, Meadowsweet, Spicebush (Lindera benzoin), Summersweet (Clethra alnifolia ‘Hummingbird’), and Winterberry (Ilex verticillata) . Plants like Winterberry and Meadowsweet will provide cover and nesting sites for birds. 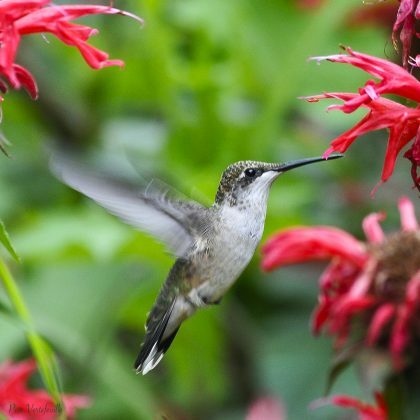 Hummingbirds, which are pollinators will enjoy Summersweet. Phase two included nearly 400 plants of 15 perennial species and seeds of five species of annuals and perennials. The plant species were selected for their functions as sources of nectar throughout the spring, summer, and autumn seasons, as well as their potential to serve as host plants for various species of butterfly and moth caterpillars. Additionally, the Ruby-throated Hummingbirds will also enjoy the nectar of these plants and songbirds such as the American Goldfinch will utilize the seed heads as a food source. The Bird & Pollinator Display and Education Garden has been supported by a team of volunteers, including landscape architect Karen Cowperthwaite, who completed the concept design and University of Connecticut Master Gardeners Robert Fossity and Michelle MacKinnon. Bette McKenna, cooperative work experience intern from Naugatuck Valley Community College, assisted with maintenance over the summer and phase two planning. Interested in volunteering to support this garden? Click here. We’ve identified 25 species of butterflies at Deer Pond Farm. With the recent addition of our pollinator garden and plans for more planting, we look forward to attracting more. Of the approximately 20,000 species of butterflies worldwide, there are 700+ in North America, and a little over 100 in Connecticut. Like birds, there are residents which spend the year in state and migrants like the well-known monarch which overwinters in Mexico and visits. Butterflies are insects from the order Lepidoptera, meaning scaly winged, which also includes moths. They go through complete metamorphosis and emerge as adults with thousands of miniature scales covering their wings. They are known for their often colorful wings, day time activity and club shaped antennae, all of which differentiate them from moths. Their habitat needs include: water, sun, shelter and plants. Host plants for caterpillars and nectar plants for the butterfly are both important. 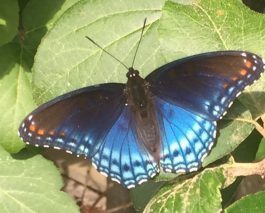 For the list of butterflies identified at Deer Pond Farm, click here. 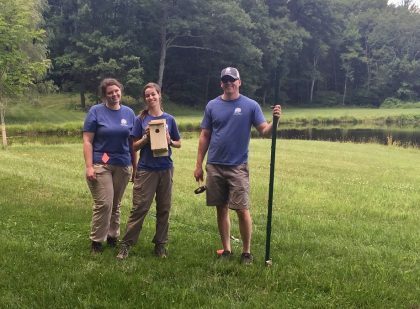 In July 2018, 10 Tree Swallow nest boxes were erected in an open field near one of our ponds. We hope to increase the population of Tree Swallows for future research by Great Hollow and are planning to put up more nest boxes in the future. We look forward to supporting this project and continuing our collaboration with Great Hollow, a non-profit organization. Similar to the Connecticut Audubon Society, their work focuses on environmental education and conservation. Other projects which we are working on together include the CT Bird Atlas Project and the Northeast Interior Motus Wildlife Tracking System project funded by FirstLight Power Resources. The Connecticut Audubon Society will install two telemetry receiver system antennas to capture critical data on bird migration, thanks to a matching $9,323 grant from FirstLight Power Resources. A new generation of highly miniaturized radio telemetry antennas, the Northeast Interior Motus Wildlife Tracking System allows researchers to track the movements of radio-tagged birds, bats, and insects across thousands of miles of distance with precision. Named after the Latin word for “movement,” the Motus system shares data with researchers throughout the Western Hemisphere. Local data will be provided to Connecticut Audubon Society as a hosting organization. “FirstLight Power Resources is excited to be able to support this important scientific project in continued support of the Connecticut Audubon Society’s commitment to conserving the environment,” said Len Greene, FirstLight’s director of government and regulatory affairs. 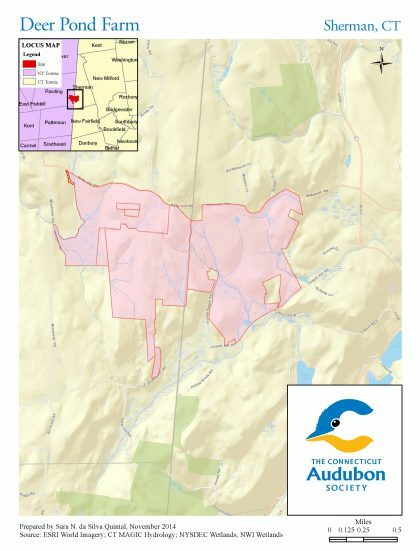 Connecticut Audubon will install the two telemetry antennas within the Housatonic River watershed region – one at Deer Pond Farm in Sherman, and the other at another key location to be determined. Chad Seewagen, PhD, executive director of the Great Hollow Nature Preserve and Ecological Research Center in New Fairfield, will assist with technical guidance and data gathering. Installation of the antennas will be completed within six months, with continued calibration and data gathering throughout the one year grant period, with data collection to continue afterwards. Connecticut Audubon Society’s mission is to conserve Connecticut’s environment through science-based education and advocacy focused on the state’s bird populations and their habitats. It is our pleasure to announce that Jim Arrigoni, conservation biologist, began his new role with Connecticut Audubon Society on Friday June 1. Jim will primarily be in charge of land management at Deer Pond Farm and assisting with management projects on other western CAS sanctuaries. He will also continue to lead educational and outreach environmental conservation programs throughout the state. Over the past 20 years, Jim has worked as a field biologist throughout the northeast and western United States, as well as Belize and China. Although his greatest expertise is with amphibians and reptiles, he also has extensive experience with invertebrates, trout and salmon, and, of course, birds. He has taught courses in conservation biology, aquatic ecology and herpetology at SUNY Syracuse and Goodwin college in East Hartford. Beyond natural history and ecology, Jim is especially interested in understanding how people interact with and influence nature and wildlife, both historically and in the present day. He aspires to apply perspectives gained from his education and travels to finding solutions for the harmonious co-existence of people and nature in his home state of Connecticut. Toward this end, he views habitat restoration/management and public education as equally important endeavors.